Sealuxe founder, Tanya Droege, caring for a coral tree during a recent scuba diving trip in Raja Ampat. You’d have to be living under a rock not to know coral is dying at an alarming rate. Look no further than Australia’s Great Barrier Reef where almost all coral had died from mass bleaching. This process occurs when the ocean water is warmer than usual. It kills the colourful algae that lives in them (which also provides coral food). Dissolved carbon dioxide creates more acidic waters, which limits the coral’s ability to build their iconic limestone skeletons. While coral reefs cover less than one per cent of the ocean floor, they support about 25 per cent of marine life. Due to the above reasons – climate change and ocean acidification – as well as others – disease, over-fishing, and other stressors such as common pollution (including most sunscreens!) it’s another item on the ocean’s growing most endangered list. Ocean biologists are racing against the clock to figure out ways to help coral and one of those people, a Dr. David Vaughn, has discovered something interesting about the sea animal. The senior scientist for Mote Marine Laboratory in Florida, recently found a way to make coral grow up to 40x faster than it does in the wild. Like many other discoveries before, such as penicillin, it was discovered by accident. Vaughn was trying to move a piece of coral that had attached itself to the bottom of one of the laboratory aquariums and it broke into many tiny pieces. Vaughn let it be and, a few weeks later, noticed that it had grown back into the same size. This was mind-boggling as the original coral’s size had taken three years to grow! 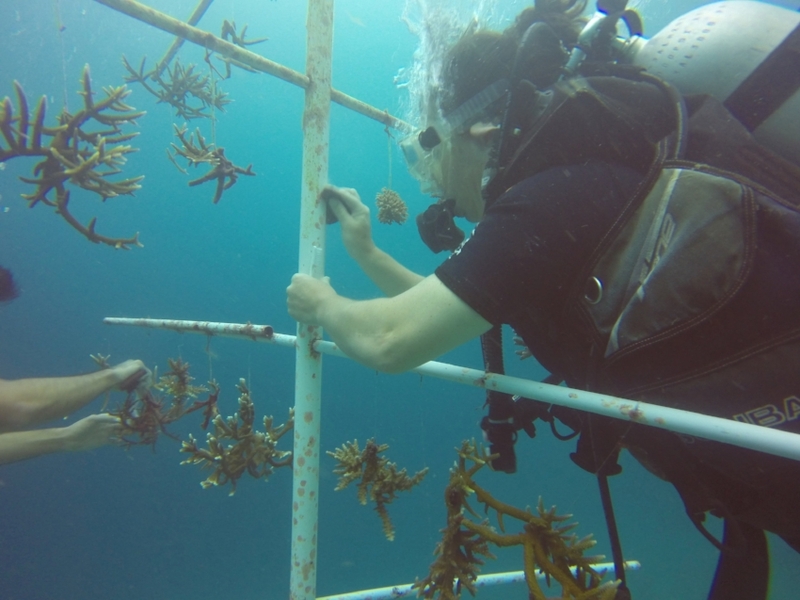 It used to take Vaughn’s team six years to produce 600 corals for transplanting. Now, thanks to micro fragmentation where the coral is broken into tiny pieces and fuses itself back together, his lab can cut and produce 600 coral in one afternoon. When coral in the wild touches each other during their growing period, they will often attack one other. But when the bits of coral touched each other in the lab, they fused together, recognizing they were from the same colony. In one to two years, Vaughn’s lab could grow coral to a size that would normally take 100 years. Just as astonishing, the micro fragmentated coral became sexually mature in one to two years instead of its regular 25-75 years. Vaughn’s team grows coral in the Florida Keys National Marine Sanctuary where it hangs on tree-like structures to accommodate its growth. Part of the research is experimenting with coral strains to make them more resistant to warmer waters. Which, going at our current rate, is a sad inevitability.